Need something that can quickly and easily clean large indoor & outdoor spaces? 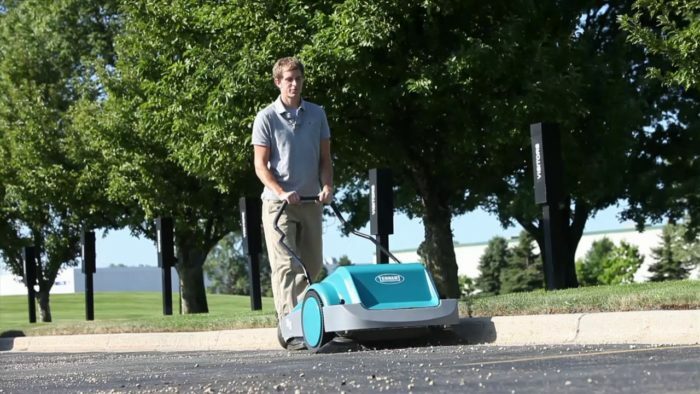 The Tennant S9 Wide Area Sweeper is a battery-operated, self-propelled, walk-behind rider sweeper that allows you to clean any hard surface or carpet without exerting yourself. But, why buy one at your own expense when you can hire a commercial cleaning company that has a Tennant S9 in its arsenal? Before looking at the features and benefits of the S9, let’s discuss the problems with typical wide area cleaners. It’s not that typical wide area cleaners don’t serve their purpose. They do. But, they come with several problems that can spoil your day. One problem with most typical wide area sweepers is they are not user-friendly. Typical wide area sweepers are so noisy you cannot use them during office hours without disrupting the normal flow of work. They consume a lot of power, which makes them costly to operate. They break down frequently and require high preventive maintenance. Common problems include the machine stops operating, the brush motor doesn’t operate, the machine doesn’t self-propel, the vacuum motor doesn’t operate, there is little to no solution flow, the water pickup is poor, the sweeping performance is poor, and the runtime is short. The Tennant S9 Wide Area Cleaner is an innovative machine that puts the fun into cleaning large areas. That’s right; this battery-operated, self-propelled machine is so easy to operate you will actually enjoy walking behind it as it sweeps the floor clean. The Tennant S9 has several features that reduce the cost of cleaning wide areas. Its quiet 62 dBA motor allows you to operate it during office hours, which keeps labor costs down. The ec-H2O NanoClean™ technology, which electronically converts water into a cleaning solution, reducing the consumption of floor cleaners and detergents. The Tennant S9 helps improve the image of your facility by enabling you to keep your facility clean and healthy without much effort. In times of emergency, you can clean your facility within minutes, making it ready before your guests arrive. The Tennant S9’s ergonomic design reduces the risks of accidents and injuries, and its maintenance-free batteries allow you to clean it safely. The battery-operated Tennant S9 has zero emissions, which makes it great for the environment. Once you start using the Tennant S9, you will notice the following changes in your office within days. When you leave your office cleaning to us, you won’t find yourself grumbling about substandard cleaning, employees who call in sick, and rude customers. P.S: If you want to know how to keep your facility clean and healthy, all while keep the cleaning costs down, then get in touch with Team iNX for a free demonstration.